So you wanna be a cowboy? Out of the West-Honolulu, a cowboy clothing company in Aloha Tower Marketplace, celebrates its first anniversary from 9 a.m. to 9 p.m. Saturday, with prize giveaways and discounts of 10 to 75 percent off all its western wear and accessories including belts, buckles, bolo ties, cowboy hats, purses and boots. 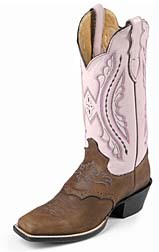 The women's boots ($275) by Justin, shown, is one of the most popular styles. Gentlemen prefer the CY885 ostrich boots by Lama, at $595. Show off your new duds by joining the line dancing and roping demonstrations from noon to 3 p.m. in the Marketplace's Center Atrium. Yee-haaaa! Take a break from all life's hustle and bustle to take a look at the moon during Sunday's Tsukimi no Kai, the seventh moon-viewing celebration hosted by the United Japanese Society of Hawaii, Japanese Culture Center and Shufu Society of Hawaii. Moon viewing in Japan traditionally celebrates the fall harvest with music, food and fellowship. The event takes place from 6 to 9 p.m. at the Kapiolani Community College Ohia Building. Cost is $30, which includes a buffet and entertainment. The evening begins with a traditional Shinto blessing, then continues with tea and sake ceremonies, folk music and dance, poetry writing and a bon dancing under the full moon. The Friends of Pearl City Library will hold a book sale from 10 a.m. to 3 p.m. Sunday in the library meeting room. Book prices start at 25 cents for pocketbooks and children's books; hardcover books, as well as a large selection of videotapes, will be a dollar each. Hourly discounts will be announced throughout the day. All proceeds benefit the Pearl City Public Library and its programs. Volunteers are needed to help set up and break down. Call 453-6566. A time of grief is not when families should be making crucial decisions about funerals. Learn the elements of planning ahead at a seminar, "Don't Get Buried by Funeral Costs," 6 to 7 p.m. Tuesday at Windward Community College. Karen Ho of the Hawaii State Federal Credit Union will talk about the costs of mortuary services, laws that guide the industry, consumer rights and tips for avoiding unnecessary charges. The session is free. Call 235-7433. Tomorrow is the deadline to purchase tickets for Hui Maka'ala's 36th annual Scholarship Fund Fashion Show, taking place Oct. 23 at the Sheraton Waikiki Hotel. The show promises something for fashion lovers of all ages, featuring the exuberant, colorful creations of Betsey Johnson; the classic Oyako creations of Vicki Yamagami Ragasa and her daughter, Jaime Ragasa Hittelman; and the casual elegance of Gilda Minassian's Calista by Cotton Cargo. The event starts with boutique sales at 9 a.m., lunch at noon, followed by the show at 1 p.m. Tickets are $50. Call 387-2451 or 741-6364 for reservations. Make checks to Hui Makaala Scholarship Fund, 5333 Likini St. No.1801, Honolulu 96818.